I realize Father's Day was so 4 days ago but it doesn't have to be Father's Day to let that awesome guy in your life know you care, right? I personally have the hardest time buying for dudes because usually the things they want are electronic that end up costing me A MILLION DOLLARS so I'm sharing a few of my current affordable, manly favs! 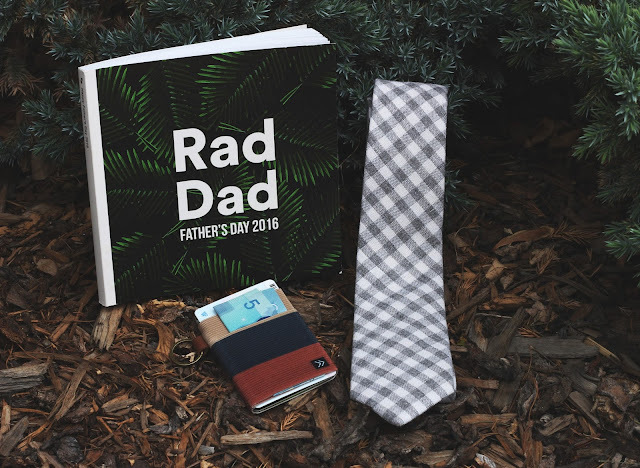 I veered a little more to the sentimental side for this one and rounded up about 200 of my favorite photos of JP and threw them into the Rad Dad Chatbook that was being featured this year by Chatbooks for Father's Day. Some of the photos included a caption that stated why Remi and I love him so much. Sweet and simple! You can make one for a friend, a sister, a teacher, or really anyone! If you haven't started books of your own, you're missing out! (read of how I document with them here!) I whipped this book up in about 30 minutes and it's quite thick! It was a great price and I loved the cute little custom drawings they provided for each page if you wanted to include them. You just can't go wrong with a chatbook. Okay, you can't really go wrong with a tie either but I am a little bit picky about ties! I love them to be a bit skinny and I love a matte print - glossy and shiny isn't really my thing. This company named Dazi (daw-zi) USA provides some of the neatest prints I've ever seen. They make a man in floral look GOOOOOD. Check them out for yourself! I bet you will love them. My new favorite of all favorite wallets has become this handy little elastic, slim wallet by Thread Wallets. Most guys carry their wallets in their back pockets and most guys don't want it to be bulky and uncomfortable, am I right? Finding these was the best ever. I have one for myself and I can honestly say it's the best thing if you don't like carrying around purses, bags, etc. It fits so well in your back pocket (even while wearing skinny jeans), has a little circle loop that can connect to your keys or clips, and it keeps all of your cards super snug together. They are always coming out with neat prints so go and grab one! You definitely won't regret it. So there you have it! Some sentimental, trendy, and convenient gift ideas for your man that aren't going to break the bank. Would love to know what other things your husbands, boyfriends, fathers, etc. like to be gifted! I'm always up for suggestions!